Protesters who have camped out at City Hall for weeks, demanding Philadelphia stop giving arrest data to immigration officials, say Friday's decision to do just that was a victory. Now, the protesters have to leave. Philadelphia will stop giving U.S. Immigration and Customs Enforcement access to a real-time arrest database, accusing the agency of misusing the information to target people who are in the country illegally but are otherwise not accused of any crimes, Philadelphia Mayor Jim Kenney announced Friday. Federal officials said the decision puts U.S. citizens in danger. "We're not going to provide them with information so they can go out and round people up," the Democratic mayor said. The decision not to renew Preliminary Arraignment Reporting System, or PARS, the shared law enforcement program where Philadelphia police log information about arrested people, came ahead of a meeting with Occupy ICE activists who had blocked a stairwell in City Hall Wednesday to demand a meeting with the mayor. Those protesters have been told they now must leave City Hall by 2 p.m., they said at a press conference. 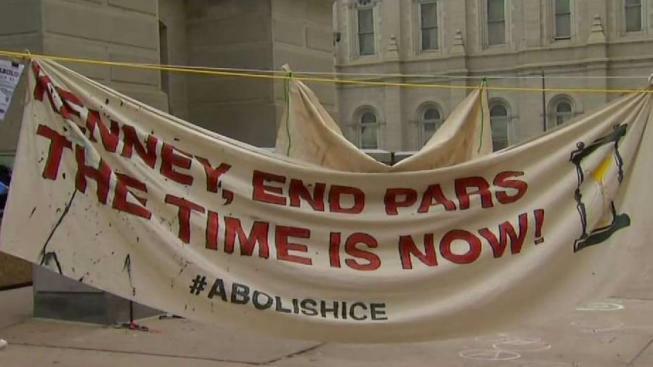 Calls to end U.S. Immigration and Customs Enforcement’s access to PARS have grown in recent weeks as dozens of protesters continue to camp outside City Hall. "For some time now we have been concerned that ICE uses PARS in inappropriate ways, including to conduct investigations that result in immigration enforcement against law-abiding Philadelphia residents,” Kenney said. “My Administration engaged in dialogue with ICE in recent weeks about its use of PARS data, and rather than allay these concerns, ICE officials in fact confirmed many of them." Currently, immigration officials have access to country of origin and Social Security data after an arrest is made. But that contract is scheduled to end on Aug. 31. Anyone who interacts with law enforcement is entered into the database, including those who are arrested, victims and witnesses, with limits on what ICE officers can view. "How anyone can define this as making America great again is beyond me," Kenney said. Kenney and City Solicitor Marcel Pratt gave five reasons for ending the PARS agreement: ICE officials didn't assure the city that it doesn't use PARS to profile by race, ethnicity and/or national origin; ICE officials can use PARS against residents who have not been accused of convicted of a crime; ICE uses PARS to probe for people who self-report not being born in the United States; ICE doesn't audit or self-monitor PARS; and ICE didn't respond to the City's post-meeting request for responses to concerns. “As a result of this process, we have concluded that ICE’s use of PARS can result in arrests of otherwise law-abiding residents for civil immigration violations when the agency executes an operation due to information found in PARS," Pratt said. "Such practices sow fear and distrust in Philadelphia’s great immigrant community, and make it more difficult for our Police Department to solve crimes. I cannot in good conscience allow the agreement to continue," Kenney said. As a "sanctuary city," Philadelphia had already curbed cooperation with immigration enforcement. It won't release inmates to ICE without a judicial warrant. ICE officials were disappointed with Philly's decision and said the agency "was at no point in breach of the teams of its access to PARS." "The city’s refusal to honor detainers, coupled now with the termination of the PARS contract further restricts ICE from detaining individuals with pending criminal matters or criminal convictions, and only adds insult to injury by needlessly compromising public safety," ICE said. "Despite these attempts to obstruct ICE’s lawful efforts to apprehend criminal aliens, the agency remains committed to its efforts to uphold public safety in the City of Philadelphia." The upcoming deadline galvanized ICE opponents, who, in addition to ending the PARS contract, would like to see the entire agency dissolved. Philadelphia District Attorney Larry Krasner is among those who called for an end to the program. Other city officials echoed the calls to end access to PARS.